This was a happy accident and totally unintentional. During the summer months I downloaded few online classes from various sources and various fields (sewing, knitting, polymer clay, cake baking - to name just a few). One of those classes was Knit Brilliant Beads by Betsy Hershberg. I love her jewelry, learned a great deal from this class but somehow bead-knitting was not my thing, not at the moment anyway. I love her enthusiasm and love of the craft, her eye for detail is amazing and the final results simply gorgeous. Many times when I am taking a class, I am not always that interested in the featured craft, but I enjoy the creative energy that is involved in teaching and I always get very inspired and many new ideas. And I did walk away with something. I could not get rid of the idea of making beads, but I did not know what kind of beads. I made few knitted ones with embroidery on them, but something did not feel right. 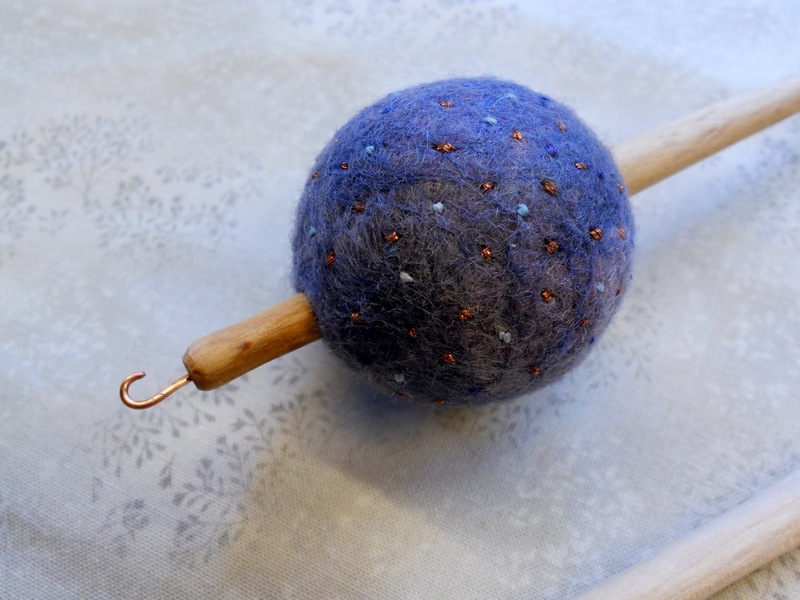 For a while I thought about polymer again, but then one day I grabbed a bit of fleece and made a felt bead. The bead is not the usual light bead when made of plain wool but it is quite heavy since it has a wood bead inside. While I was embroidering it, I stuck a long needle through it to have something to hold on to when embroidering, and then I showed it to my daughter (who loves all kinds of tops) how well the woolen/wood bead whirled and then I realized that this bead would make a good spindle. 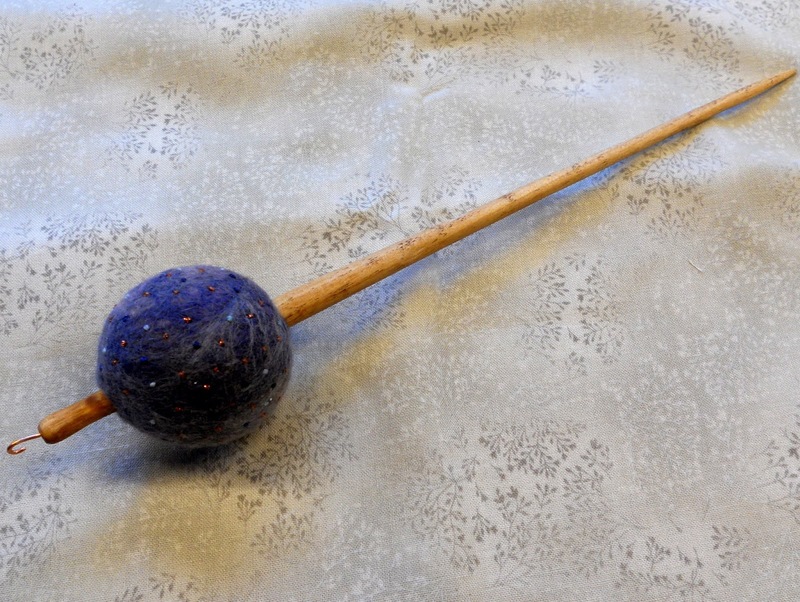 After a few hours with a knife and a wooden stick, my very first spindle was born. As I am looking out of the window, it is grey and the wind is picking up. We are supposed to get heavy snowfall today, the weather forecast said 8"/20cm, but so far we have had some rain only. I wonder if we really are getting lots of snow today. Before I go, let me show you a piece of dog art. Ruusu made this image yesterday on our daily stroll. If you look closely at the picture, you can see a tail and legs and almost ears. She loves snow and even when there is very little, she has to make angels. Everything you touch converts in something beautiful...have a good week! Love the dog snow angel! Your spindle was very beautiful, but my day was made by the snow angel. Hope your day is lovely. 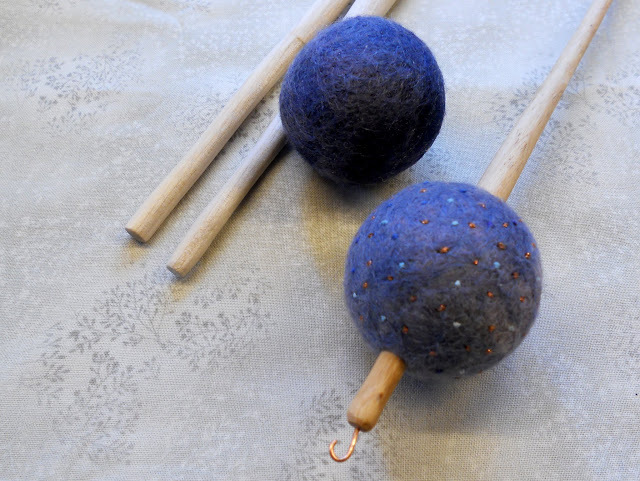 You make the most beautiful things-- I love the spindle and what a unique idea! And obviously Ruusu has a creative streak as well. awwww! you are so much fun to read! that totally made my day. Ooo I love the dog art. It reminds me of cave art! The spindle is brilliant. I think you're on to something. Ruusu's snow angel took my breath away. Looks like he's running. Your spindle is lovely. And the dog's snow angel is simply perfect! You have the most beautiful sense of art. Although I have always appreciated the natural environment, I am always inspired to stop and notice just a little more when I read your blog. Now, if only I would have your original creative instincts! 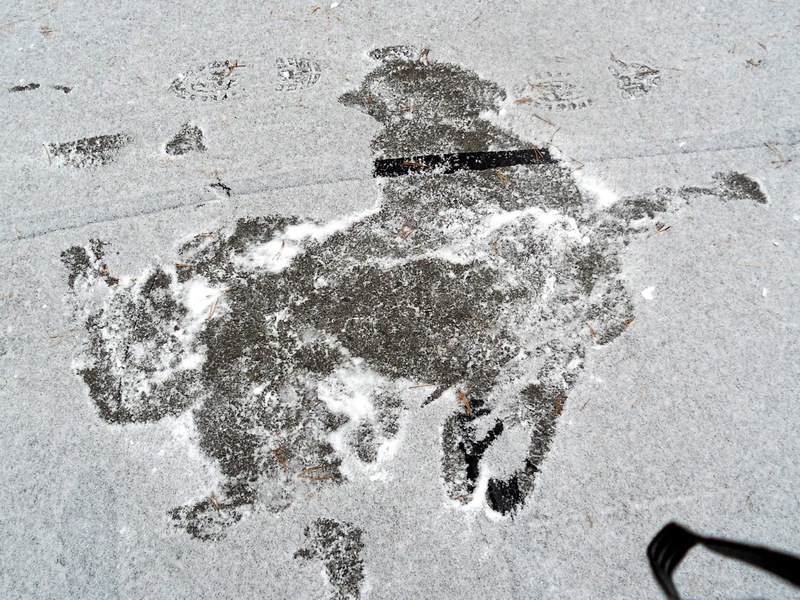 The doggie snow angel is fabulous! I miss your blog reports and the inspiration from your charming hand work. Some small quilted items and knitting is on my holiday to-do list. Wonder of wonders, it's actually being finished in a timely manner!